Market Rasen Town were unable to derail the Lincolnshire League pacesetters as they welcomed Sleaford Town Reserves to Rase Park. Sleaford recorded their first league win in five when they completed the double over Rasen on Saturday with a 2-0 win. Leading scorer Nathan Thompson hit his 14th goal of the season to help end their recent barren spell. The visitors’ other scorer was Jasper Caudwell with his fourth league goal of the season and his first since October. Brigg slipped to their third straight defeat as third-placed Wyberton fought back after trailing to secure three valuable points at The Causeway. Jake Parker goal gave the Reserves a 1-0 lead at the break, but goals from Elliott Pogson and Curtis Revell turned the game on its head. It finished all square at Fulstow as both sides recorded their third league draws of the season. Simon Mowbray made it 23 goals from 14 league games, but this was cancelled out by Carl Martin’s second of the season as the Therm made it three league games without defeat. Gary Nimmo struck twice as Cleethorpes Town Development Squad climbed to seventh in the table. Arslan Alsparlan also scored his first league goal for the seasiders, while the Lincoln-based visitors replied through Elliott Coombes on his first league outing. Skegness Town climbed back into second place with this convincing win over East Lindsey rivals Horncastle. Liam Parker swept home the opener after half-an-hour and skipper Ben Davison made it 2-0 on the stroke of half-time. Skegness keeper James Lambley kept the two-goal advantage intact when he saved from Ben Fidling, and minutes later Davison grabbed his second to put the seasiders in the driving seat. Will Britton scored a brace before Luke Rayner-Mistry slid in the sixth goal. Substitute Matt Veall wrapped things up with a late goal, his first of the season in the league. Hykeham squeezed their way into their second cup final of the season with victory by the odd goal in five at Skegness Grammar School. Having already reached the Lincolnshire FA Junior Cup final, Hykeham won this Challenge Cup semi-final thanks to goals from Josh Raby, Robin Newman and Matt Easton. George Hobbins and Danny Reid were on target for United. 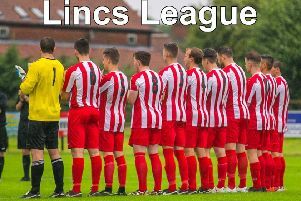 Hykeham meet Sleaford Town Reserves in the final at Lincoln United’s Ashby Avenue ground on Saturday, May 7.